Recently I’ve been inspired by many taggie toys tutorials. A taggie is a toy for babies meant to develop their motor and tactile skills, hand-eye coordination and sensory stimultation. These are performed by different tags attached to the toy, bright color and various textile materials ( felt, silk, satin, cotton ), nice appliques and embroidery. Although there is a ton of various tutorials around the web, I have decided to make something unique. So I gathered all the ribbon, lace and textile leftovers I had and came up with with the toy concept. 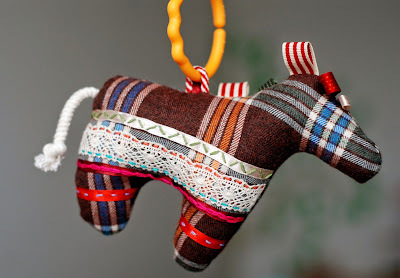 Since this year is a year of horse according to the Chinese calendar, I chose to make a taggie horse. 1. I have sketched the horse-shape by hand on the paper and cut out the stencil. 2. After transferring the stencil onto the fabric I cut out two similar details adding 0,5″ (1cm) of seam allowance. The idea I had in mind is to attach felt circle appliqués at one side of the horse and to place some ribbons of different textures at the other side of the toy. 1. Cut out four felt circles of different bright colors ( scientists claim the in their early days babies see only bright contrasting colors ) and attach them randomly with the straight stitch to the one of the horse parts. 2. Across the other part of the horse I have attached a row of different ribbons and lace using different decorative embroidery stitches. These will create a unique tactile experience for the baby. 3. Cut 2″ (5cm) of different ribbons. Bend them in half and stitch the ends together – you will have a kind of a loop as a result. These will be your tags. 1. Sew the horse parts together, right side together. Leave a few inches open. Turn the toy inside out. 2. Stuff the toy with any toy stuffing you have in hand. Keep in mind that if you choose to use wool or grain ( which is more eco friendly indeed) you will have to avoid washing the toy. 3. Sew by hand the opening, after the stuffing is done. Would love to see your creations inspired by this post.